You are here: Home / Journal / What is this flower? This flower is just now flowering. It’s a bulb, so only flowers once a year at exactly this time. Soon, two biggish green leaves will start growing either side of the flower. I have a question for you clever bunnies. Does anyone know the name of it? Don’t know the name but it is one FANTASTIC flower and Jen, your photography always blows me away! again, no real help from me – I have just worked out I have clivias if that does anything for you!!! It is gorgeous, though. How beautiful…and the color is just amazing. I have no idea what it’s called Jen…..
Beautiful photo! No idea what it is…but it looks great…and JJ’s spelling everything out is so funny…my nieces were doing the same to me too!!! In my local paper there’s a small gardening section and they mentioned this flower in there. It’s called a blood lily or a Haemanthus sanguineus. 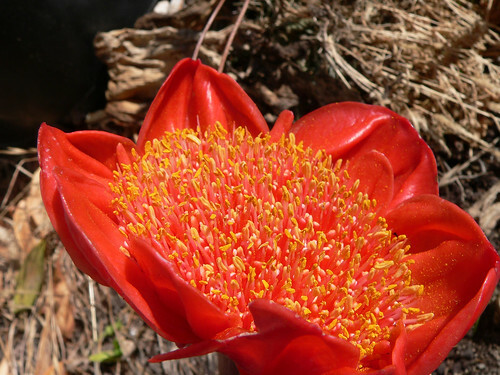 There is one commonly mentioned in textbooks called Haemanthus coccineus. Truthfully I’m not sure which one mine is.